According to the National Highway Traffic Safety Administration, large trucks accounted for 3,964 fatalities in 2013. That is the fourth straight jump in annual large truck-involved fatalities, dating back to 2009. The Federal Motor Carrier Safety Administration reports that the top ten most common factors causing these accidents are fatigue, brake problems, distractions, traffic flow interruption, prescription drug use, drunk driving, traveling too fast for conditions, unfamiliarity with roadway, over-the-counter drug use, and inadequate surveillance. 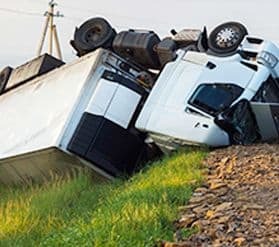 While many of the factors are attributed to the fault of the driver, there can be others who share in the blame such as the trucking company, the manufacturer of the trucks, the supplier of parts, and those responsible for maintaining the truck.